Government Adda 247 AAI Government jobs AAICLAS Recruitment for 372 Posts of Security Screeners. 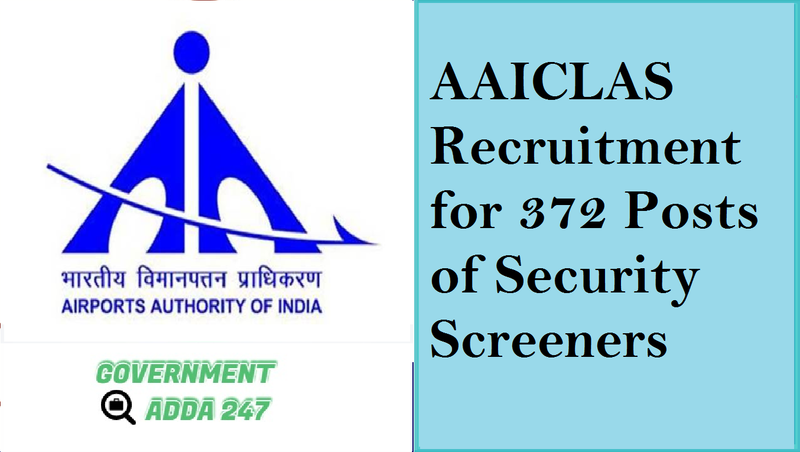 AAICLAS Recruitment for 372 Posts of Security Screeners. Airports Authority of India, Cargo Logistics & Allied Services Company Limited Recruitment/ AAICLAS Recruitment. AAICLAS has released the notification for the recruitment of various posts in the department. The total number of vacancies for the recruitment is 372 of Security Screeners Posts on Contract Basis. All the eligible and interested candidates can apply for the posts till 15 December. The last date to submit the application for the posts of Security Screeners is 15 December 2018. To know more about the AAI Recruitment notification check the information which is given below. शहर अनुसार रिक्त पद : मदुरै - 32, तिरुपति - 20, रायपुर - 20, उदयपुर - 20, रांची - 20, वडोदरा - 20, इंदौर - 38, अमृतसर - 52, मंगलौर - 38, भुवनेश्वर - 38, अगरतला - 22, पोर्ट ब्लेयर - 22, चंडीगढ़ - 30. आयु सीमा : अधिकतम: 45 वर्ष. ऊपरी आयु सीमा अनुसूचित जाति / अनुसूचित जनजाति 5 साल, अन्य पिछड़ा वर्ग 3 साल, विकलांगों को 10 साल, पूर्व सैनिक को 5 साल.